Happy Friday! A sweet and soft DIY roundup this week (links below)- hope these projects will inspire you and spark your creativity. Oh, and if you're planning a 4th of July party, you can find 10 patriotic creative ideas right here. Have a wonderful weekend! those ceramic photo coasters are so wonderful, and I love the embroidered earphones! 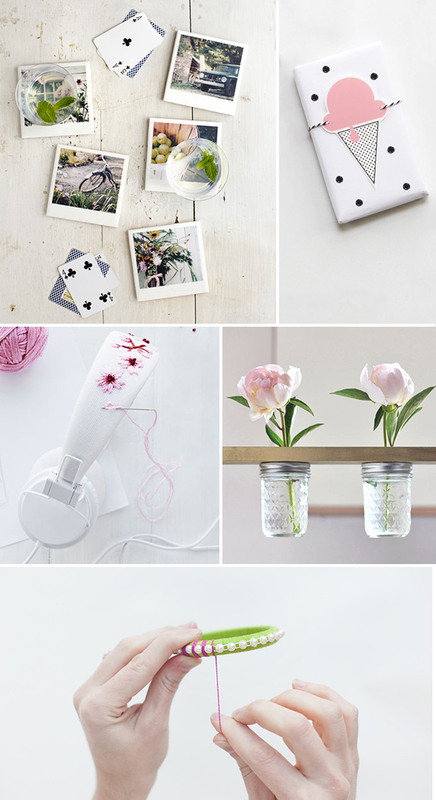 The coasters and that mason jar flower shelf are wonderful! Definitely bookmarking! I love the coasters and the shelf. ♥ Beautiful! Thanks for sharing. so much prettiness! i want to make it all!